Crossing the bay of Biscay is in the dreams of many sailors. 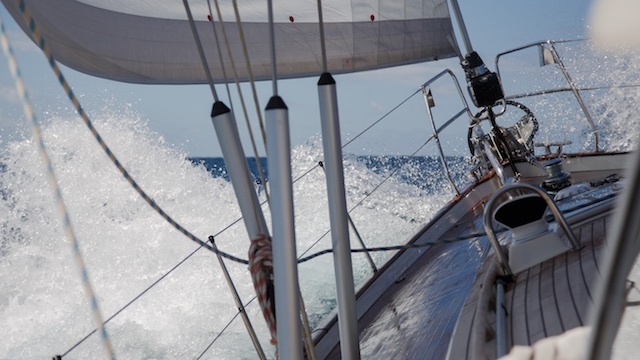 Not many coded sail training boats or charter vessels offer this, since it means that the boat in question needs to comply to stringent rules to do this. Regina Laska is commercially coded by the MCA for offshore sailing, see the safety philosophy on Regina Laska page. Regina Laska does fulfil all safety rules for crossing the Bay of Biscay and thus I can offer this type of offshore sailing. This leg is more special than this! 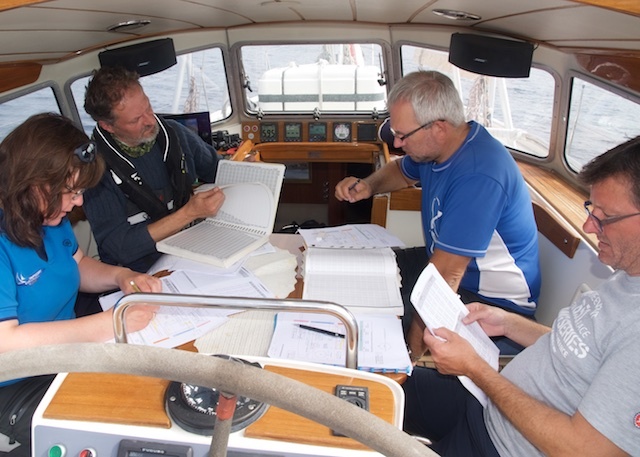 If you are planning to take the RYA Yachtmaster Ocean Exam one day, you first need to have done an ocean sailing leg covering more than 600 nm nonstop sailing. 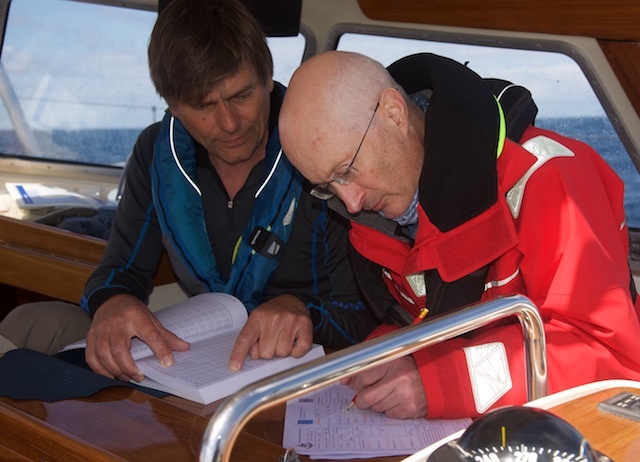 It is not necessary to hold a RYA Yachtmaster Offshore certificate to join this leg (however you need to be a Yachtmaster Offshore when taking the RYA Ocean exam later). 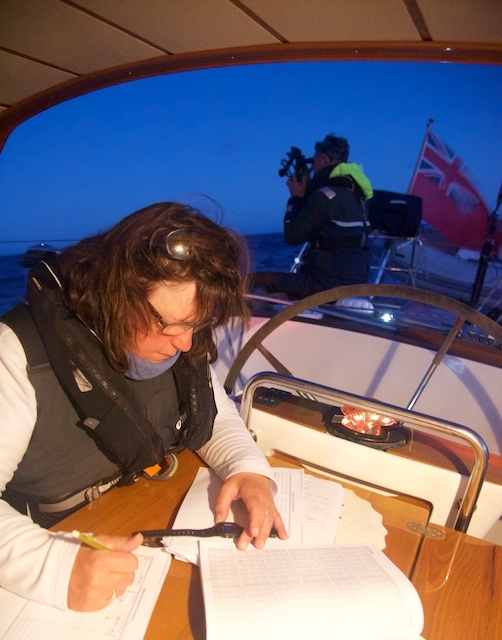 It is, however, highly advisable that you are an experienced sailor before joining this leg, e.g. 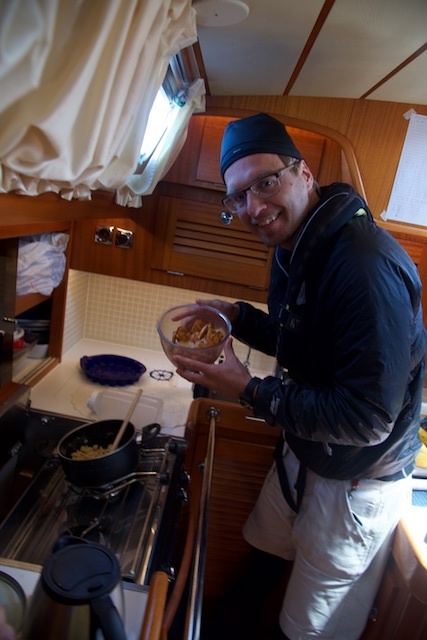 having experienced at least one non-stop sailing covering more than 100 nm on a previous Reginasailing leg. So many sides of the Bay of Biscay. I have crossed the Bay many times by now and each time is individual and a fantastic experience! 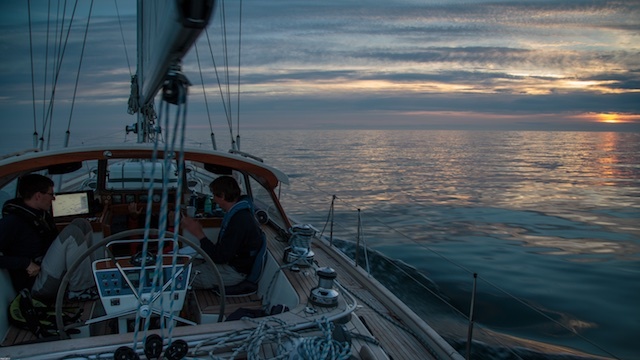 A wonderful calm night on the Bay of Biscay. 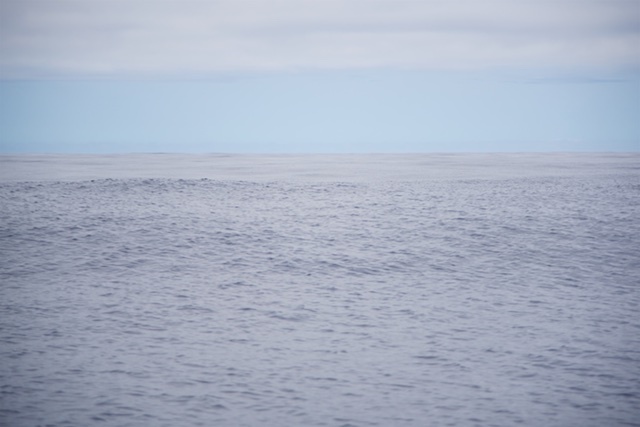 The breath of the Atlantic with a never ending swell, even when totally becalmed. It’s difficult to capture the rising and falling swell of the Atlantic, which more look like hills than water. It needs to be experienced in real! 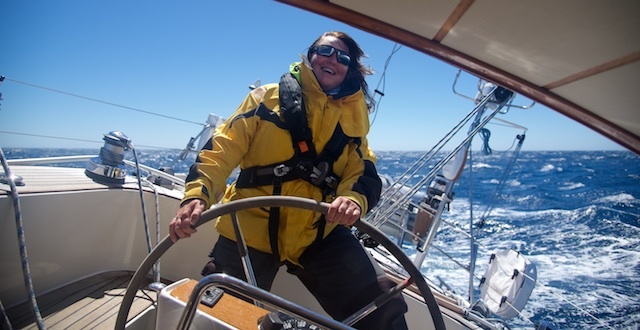 Windy upwind sailing on the Bay of Biscay, which is yet another face of the Bay of Biscay. Having said that, we do not take any chances! Especially, since we will be crossing quite late during the season. 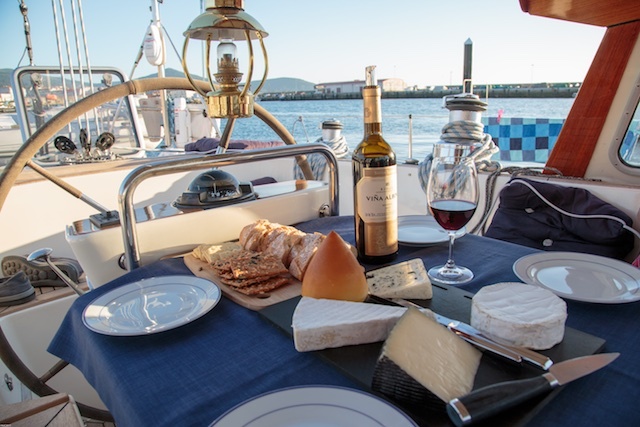 Therefore, we have allocated no less than 10 days for this 4-5 days sail, leaving us just as many days to explore beautiful Ireland or, if we are quick, cruise around in Galicia, before arriving in Portosin, close to Santiago do Compostella (with great flight connections). 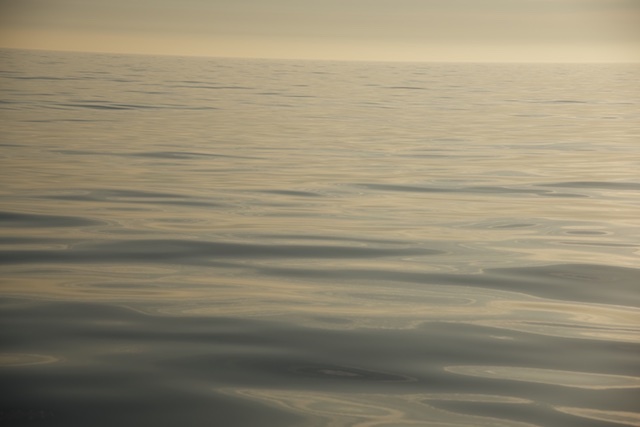 We also have the option not to sail the entire distance in one go and, instead, make a short stop in Cornwall and/or Bretagne, should weather dictate us to do so. 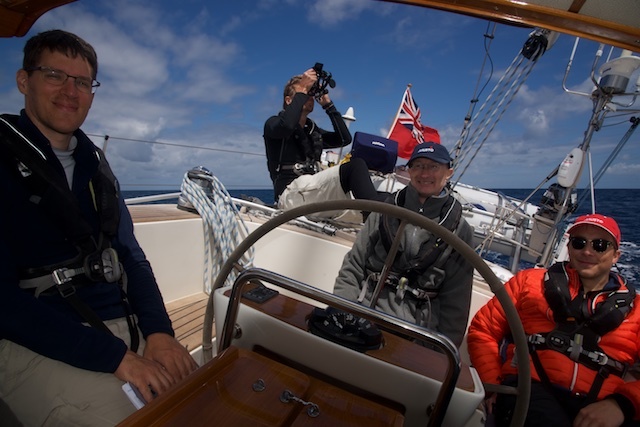 The leg would then no longer be classified as an “RYA Yachtmaster Ocean Qualifying Leg”, but safety and comfort onboard goes first. 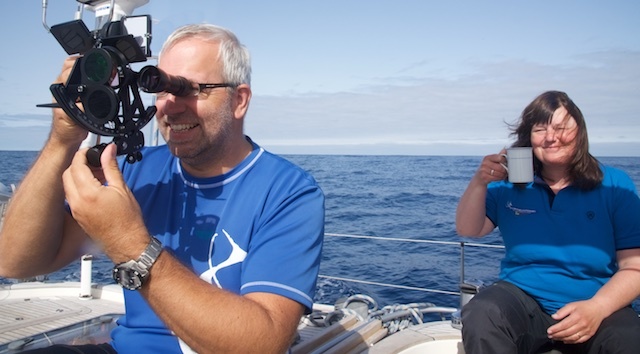 But if weather and crew is feeling fine, we sail the entire distance in one go, meaning you would obtain your 600+ nonstop sailing miles for the Yachtmaster Ocean. Most likely, there will be ample time to practice celestial navigation, which is fun! Celestial navigation with a cup of coffee in the morning! 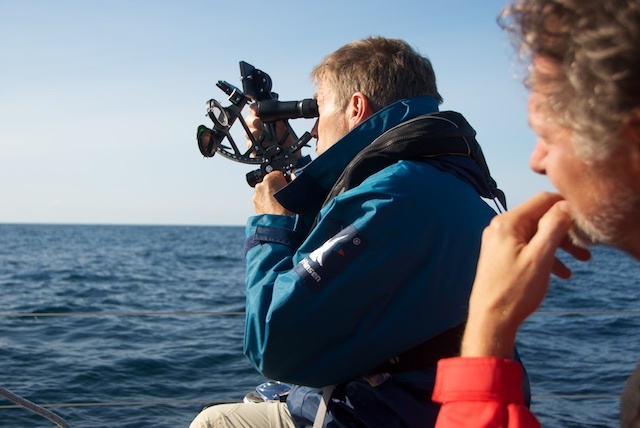 Often, the Bay of Biscay is calm enough that we can do the celestial calculations together in the cockpit. Leon teaching celestial calculations which is not specially difficult if you understand what you are doing and why. 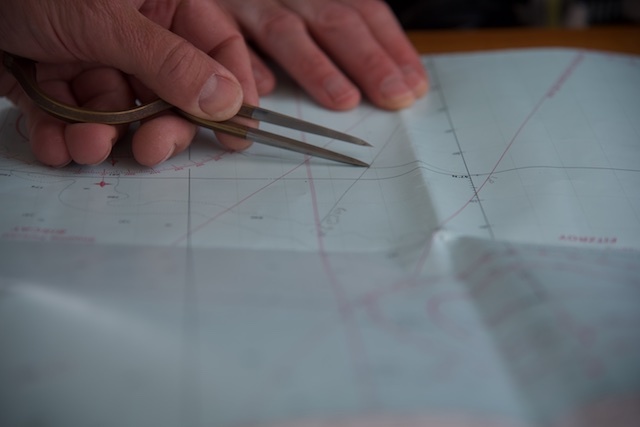 It’s a special feeling to do navigation on a paper chart with no land in vicinity! 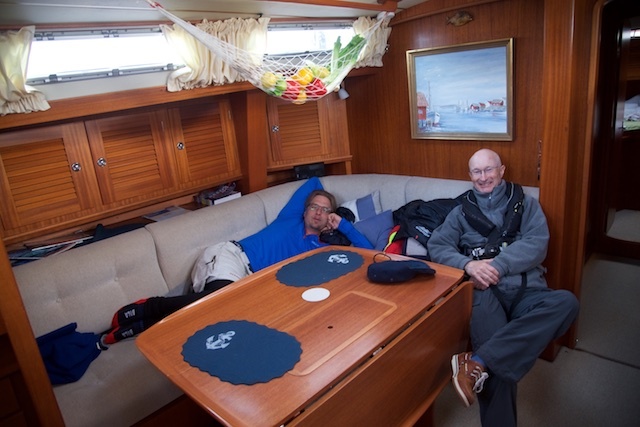 A typical day on the Bay of Biscay. 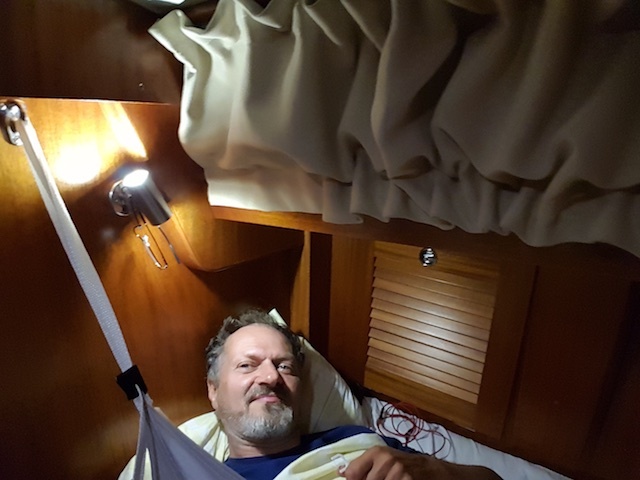 After a couple of days (and especially if you take your seasickness medication, such as Scopoderm plaster behind your ear, which works wonder), you don’t even thing of that the boat is rolling along the Atlantic edge. 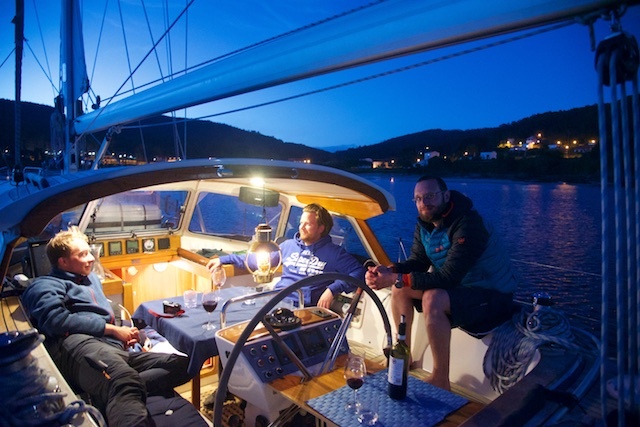 Not until you have crossed an open sea, you appreciate the cozy and safe berth on a Hallberg-Rassy. 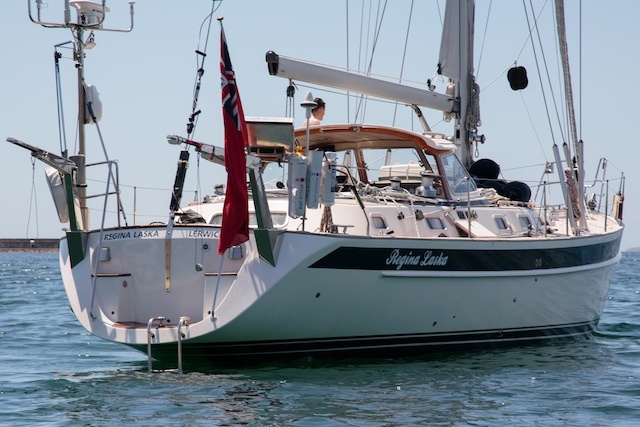 Also the toilet makes sense, and so does the Hardtop, and all the grab rails on a Hallberg-Rassy after you have crossed the Bay of Biscay. In a marina you might consider some of these “narrow”, “restricted” or even “cramped”. 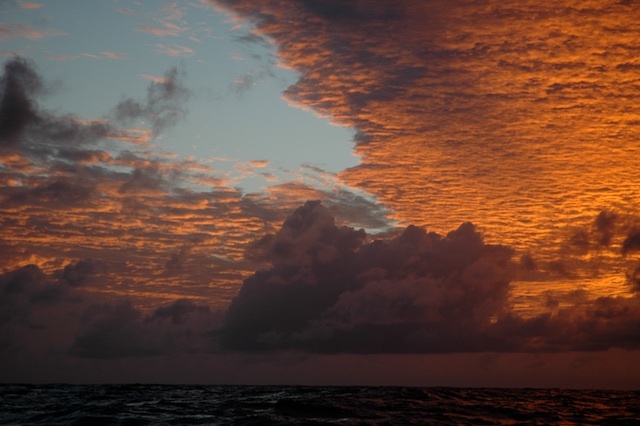 Once you have experienced real ocean sailing, you understand why. 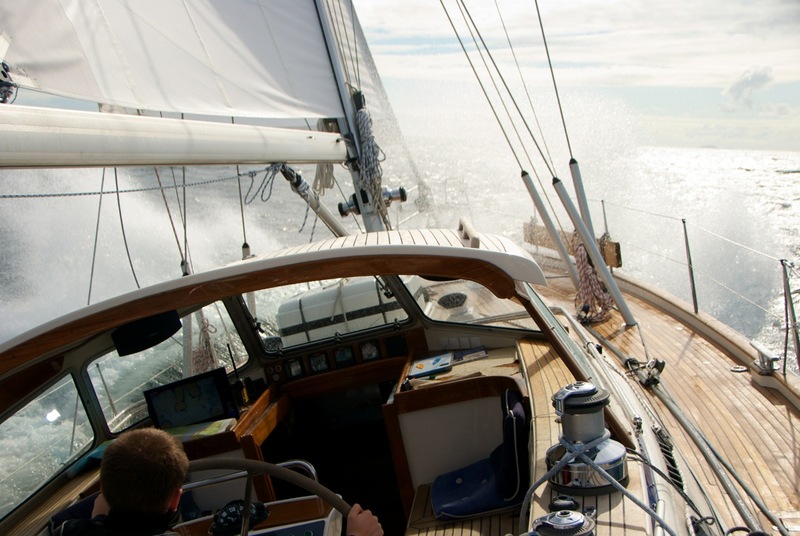 And that safety and comfort results from the design of an ocean-going sailing vessel. 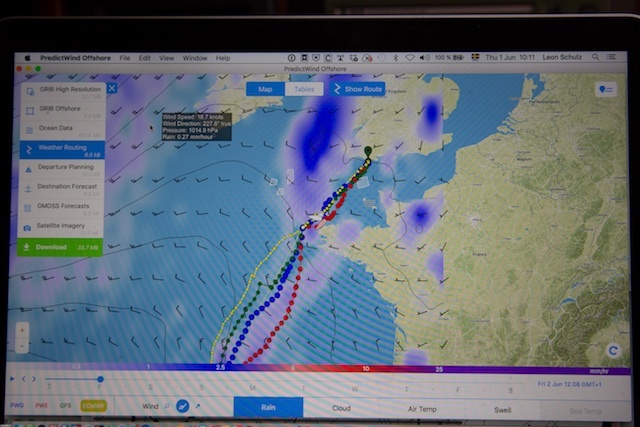 Advanced weather routing, both from ashore as well as onboard weather interpretation of synoptic charts, routing software and satellite communication will be used to allow for a safe and quick crossing. Weather-Fax, Inmarsat C, TimeZero as well as Predict Wind (see above) is being used for weather routing. 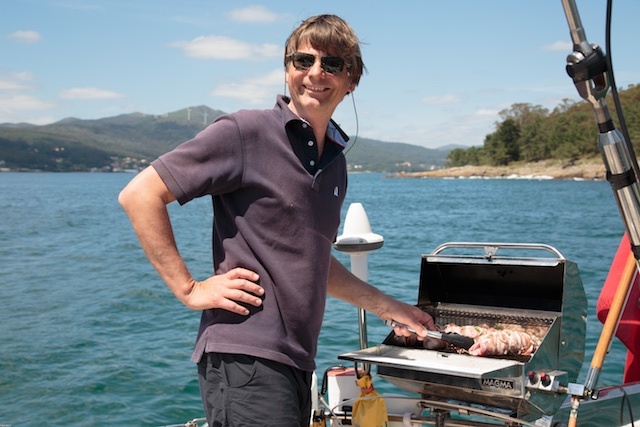 Once we arrive in Galicia the sun and Galicien Atmosphere will welcome us! 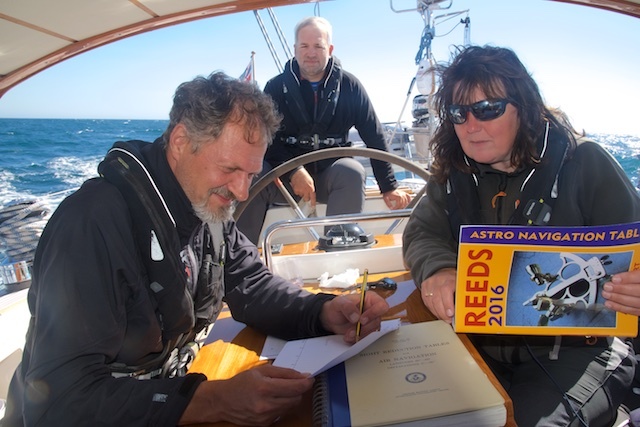 Before you join, it would be advisable to either join on one of Reginasailing’s Yachtmaster Ocean theory courses or that you prepare yourself by reading for instance the RYA Astro Navigation Handbook and Tom Cunliffe’s The Complete Ocean Skipper.